Fairy mail boxes in the garden. 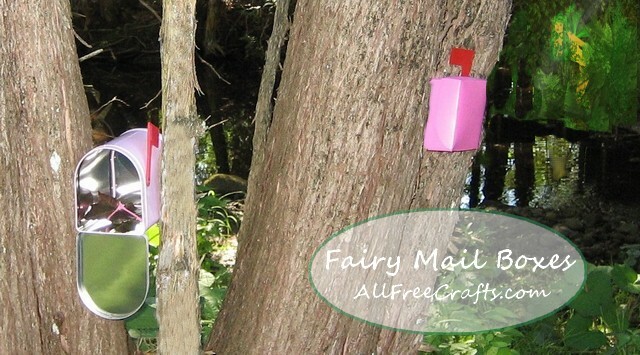 Weave a little magic in the garden by setting up a fairy mail box (or two) for your children or grandkids. This is one of those little projects that can quickly become a family tradition, looked back on in future years with whimsical delight. 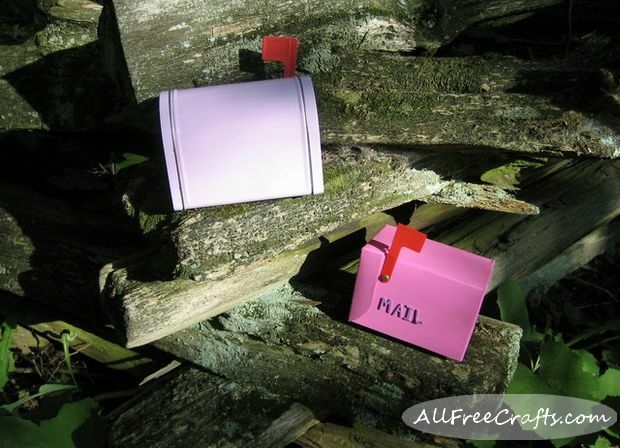 Recycling a cardboard 72-bag tea box into a Valentine Mailbox was the beginning of this nature project, but I was also lucky enough to find some miniature metal mail boxes in the dollar store, and I picked one up immediately. 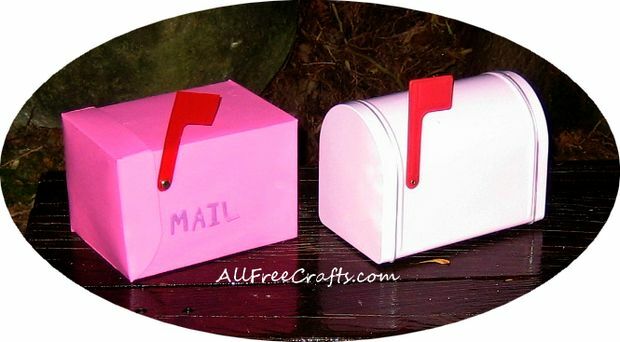 Now I had two little mail boxes, just waiting to deliver mysterious summer mail to special children of my acquaintance. As a child, my father engaged my imagination and convinced me that we had a cute little house mouse, called Vinny, who needed feeding every night. Just before bedtime, my father and I would solemnly place a cracker, or a bit of cheese, or a cornflake, in the corner of the staircase hallway. Every morning, I would run downstairs to see if Vinny ate his supper. 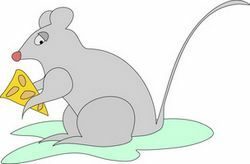 The snack was always gone, and I felt so good, knowing the house mouse had eaten well because of my father and me. It’s that kind of magic that will enfold your homemade Fairy Mail Boxes and fascinate the wee ones in your life. Whether you use a faux mail box, or a decorated tin can, or a recycled tea box mail box, the principle remains the same: simply choose a little present from the fairies to place inside and then nestle the containers in a special place outside in the garden. creek pond and in a shrub near the porch. Once, when it was raining, I put them inside my own rural mailbox. Mistake. As it happens, I learned from the children that a rural mailbox is way too high for fairies to use, even though they can fly. And that makes it way too high for kids as well. Unless you’re prepared for some fancy talking to dance around this, take my advice, and just don’t go there. The presents left by the fairies in my garden are always little natural objects. Favorites so far have included a painted wish bone on a red maple leaf and dyed star fish. These became the beginning of nature crafts for the kids, so we ended up with a pressed maple leaf in a picture frame, dyed star fish on a sea-theme mobile, and a painted wish bone mounted on velvet inside a shadow box. It isn’t necessary to have containers that look exactly like mail boxes because you can recycle all kinds of suitable containers for this project. Use your imagination and cover a cardboard tube box that has a plastic lid (such as those used to sell peanuts or cashews) with pretty scrapbook paper or an oddment of wallpaper. Add a little red mail flag cut from a plastic jar lid, fasten it to the container with a brass brad or paper fastener, and you are good to go.